Canberra from the outset has been a planned city based upon the 1912 winning competition entry from architects Walter Burley Griffin and Marion Mahony Griffin. 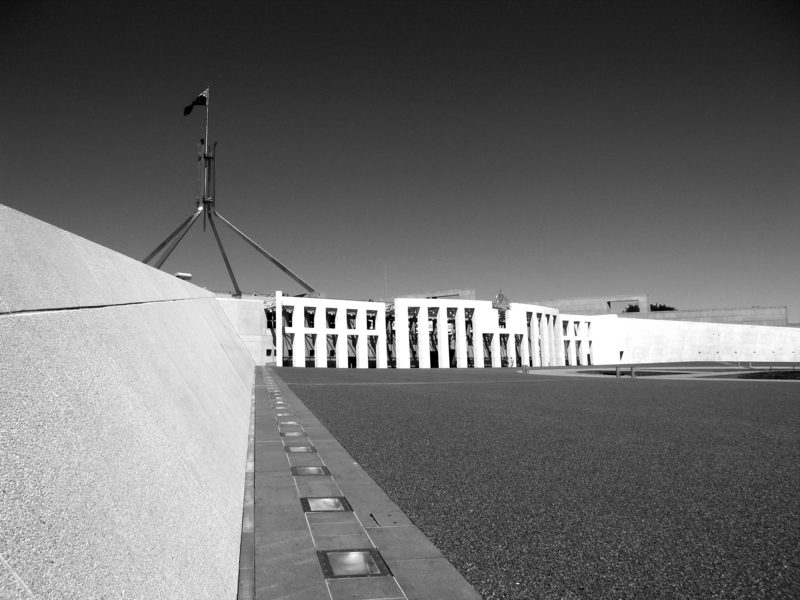 As a result of this master planning, Parliament House is undoubtedly the focal point of all of Canberra. 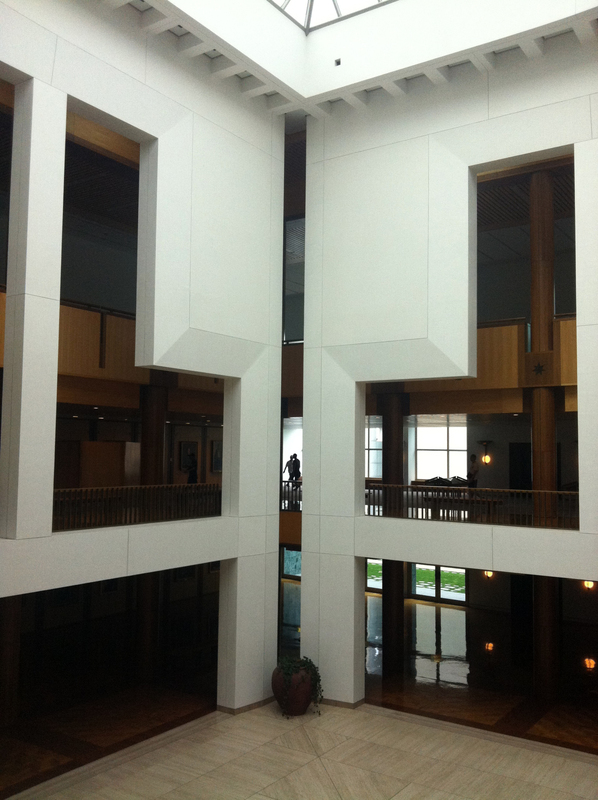 No tour or Architectural analysis of Canberra could be complete without a visit to Parliament House. 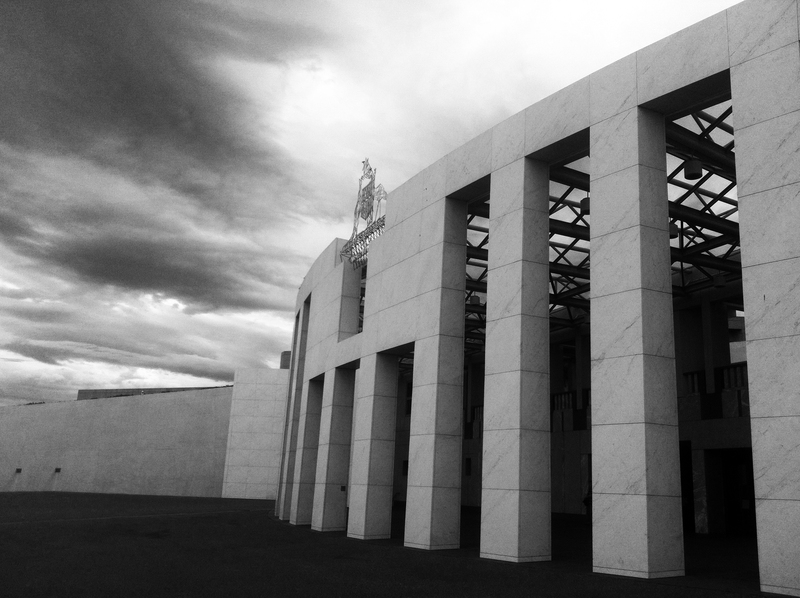 Parliament House was designed by New York based Architectural Firm Mitchell/Giurgola and Thorp architects and was opened in 1988 to replace the provisional Parliament House. Both Old and New Parliament House are situated on a clearly expressed axis which looks out over Lake Burley Griffin to the National War Memorial. The parliament forecourt references the aboriginal origins of the country with a mosaic based upon a Central Desert dot-style painting by Nelson Jagamara. 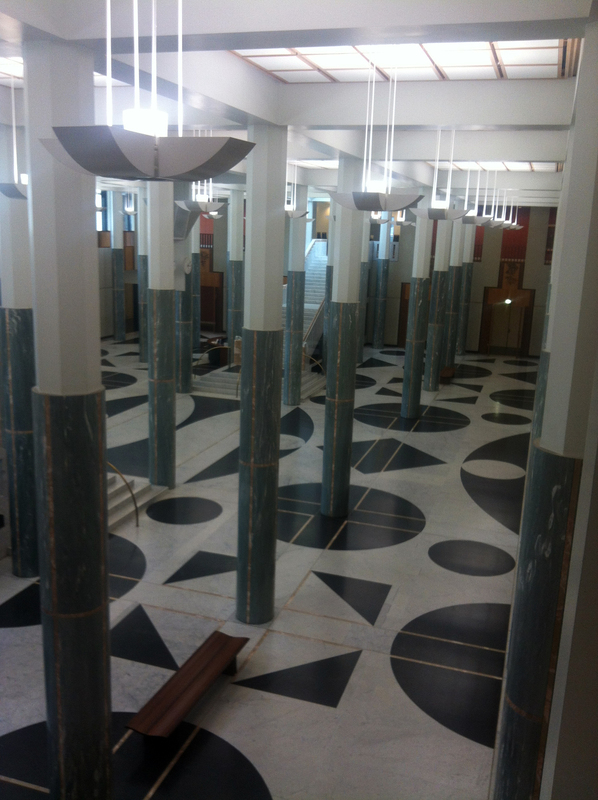 As one enters Parliament House it is done so from the same level as the forecourt and surrounds. This was an important statement by the Architects who might have otherwise followed a more traditional method of elevating the building upon a pedestal, which is common among buildings of importance. This grounded approach sets up the egalitarian relationship between the Parliament and the public. This building is an excellent example of what it means for architecture to be democratic. It allows for openness and transparency, inviting observation and participation. From the symbolism and references to the materials and workmanship, it is a building of which all Australians can be proud. This building, more than most shows that Architecture is for everyone. 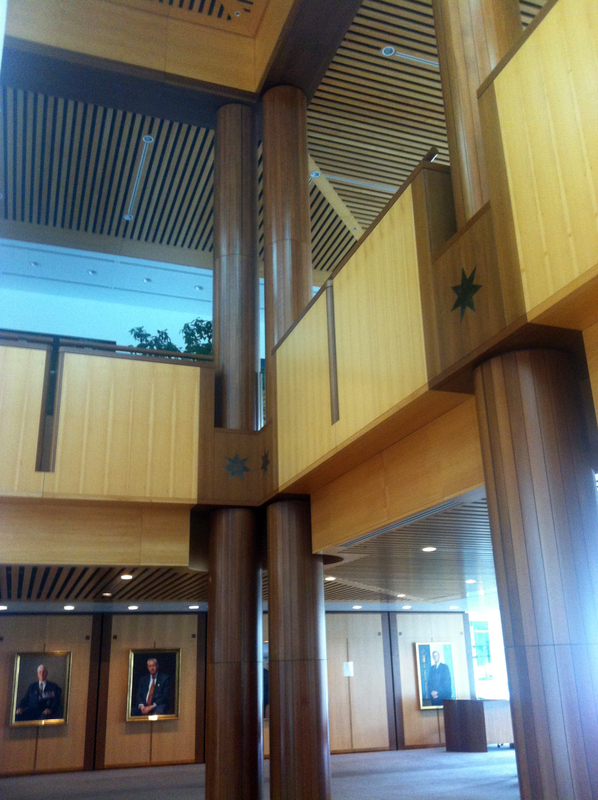 This entry was posted in 2013 Summer Series, all posts, Review and tagged Mitchell/Giurgola and Thorp architects, Nelson Jagamara, Parliament House, Parliament House Canberra, Walter Burley Griffin and Marion Mahony Griffin. Bookmark the permalink. 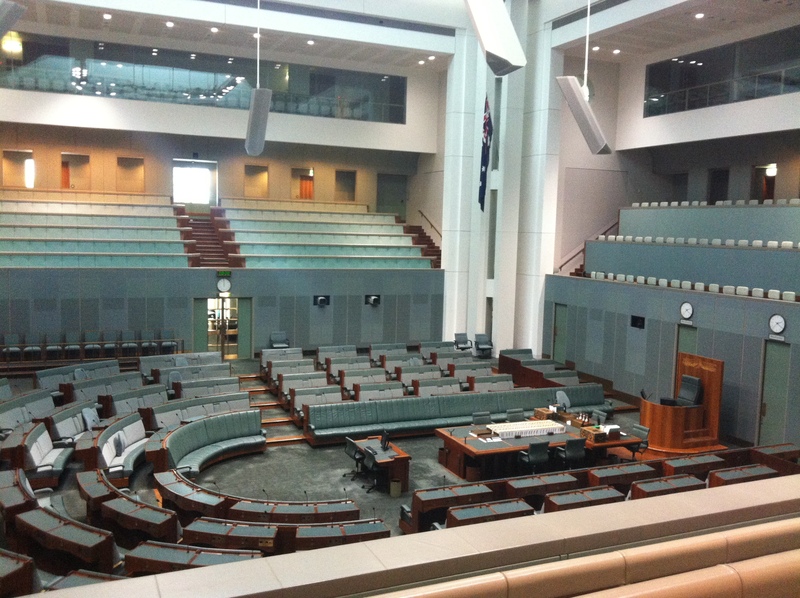 Wow, I don’t think I’ve ever seen a picture of the House of Reps from that angle. The lighting and the speakers and the glass – not to mention the rows of seats – give it an almost “sports arena” feel to my mind, which pictures of just the floor never seem to. I almost expect it to smell like vinegar and hot chips. Which is probably quite apt for an Australian democratic building. And then, I guess the objectives of sports arenas and parliamentary houses are quite similar, as you said: “openness and transparency, inviting observation and participation”. I’m sure it smells much more dignified in reality – I’ll have to get myself there one day and see for myself. Interesting interpretation…..but having sat through some lectures about WBG, i’d have to say that the location for Parliment House is inapropriate agreeing with the arguements put forward by Harriet Edquist of RMIT. The whole idea of the hill was meant for an egaliarian social focal point of which means that it was intended to be an open, transparent area (a park or the like), accesible by the public at all times. Not exactly what transpires from parliament.